View Jim Christensen's art portfolio including etchings and sculpture in our James Christensen slideshow. Put our art gallery to the test by shopping around and comparing various prices, knowing that our Price Match Guarantee will let you purchase James Christensen art at the lowest possible prices guaranteed! The Widow's Mite and other artwork by artist James C. Christensen can be viewed in our artist slideshow. 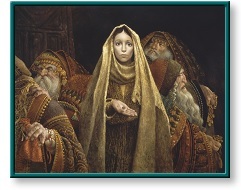 The Widow's Mite by artist Jim Christensen and other James Christensen art, art work, artwork, canvases, giclees, images, limited editions, open editions, paintings, paper, pictures, posters, and prints can all be found at Christ-Centered Art. For help with ordering and specials, call us toll-free at 1-877-843-9278. Free insured shipping! Scroll down for sizes, prices, & framing options for the The Widow's Mite. This cropped/trimmed unframed open edition canvas giclée print is brand new and ships rolled and fully insured in a sturdy tube. Perfect for gifting, this edition of The Widow's Mite contains the inherent beauty and core message of James Christensen's original painting in a standard size for low-cost framing. This open edition has been authorized by the Christensen family and the Greenwich Workshop. Framed Size 20.5" x 26.5"
Add $15 for shipping & insurance. This framed cropped/trimmed open edition canvas giclée print is brand new, comes stretched on wooden stretcher bars in a burnish bronze frame, and ships flat and fully insured in a sturdy box. Perfect for gifting, this edition of The Widow's Mite contains the inherent beauty and core message of James Christensen's original painting in a standard size. This open edition has been authorized by the Christensen family and the Greenwich Workshop. Framed Size 20" x 26"
This framed cropped/trimmed open edition canvas giclée print is brand new, comes stretched on wooden stretcher bars in a copper frame, and ships flat and fully insured in a sturdy box. Perfect for gifting, this edition of The Widow's Mite contains the inherent beauty and core message of James Christensen's original painting in a standard size. This open edition has been authorized by the Christensen family and the Greenwich Workshop. This unframed uncropped/untrimmed time limited edition canvas giclée print is brand new and ships flat and fully insured in a sturdy box. It comes stretched on wooden stretcher bars and includes a Certificate of Authenticity (COA) from the publisher. This is the first time that The Widow's Mite is being made available to collectors as a limited edition canvas. This offering is time limited, November 1, 2018 through December 31, 2018. At the close of this order window, the edition will be set and no more canvases will be added to the edition. This limited edition has been authorized by the Christensen family and the Greenwich Workshop. Framed Size 28.25" x 34.25"
This framed uncropped/untrimmed time limited edition canvas giclée print is brand new and ships flat and fully insured in a sturdy box. It comes stretched on wooden stretcher bars in a Olde World burl frame, and includes a Certificate of Authenticity (COA) from the publisher. This is the first time that The Widow's Mite is being made available to collectors as a limited edition canvas. This offering is time limited, November 1, 2018 through December 31, 2018. At the close of this order window, the edition will be set and no more canvases will be added to the edition. This limited edition has been authorized by the Christensen family and the Greenwich Workshop. Framed Size 34.5" x 40.5"
This framed uncropped/untrimmed time limited edition canvas giclée print is brand new and ships flat and fully insured in a sturdy box. It comes stretched on wooden stretcher bars in a ornate gold leaf frame w/crimson inlay, and includes a Certificate of Authenticity (COA) from the publisher. This is the first time that The Widow's Mite is being made available to collectors as a limited edition canvas. This offering is time limited, November 1, 2018 through December 31, 2018. At the close of this order window, the edition will be set and no more canvases will be added to the edition. This limited edition has been authorized by the Christensen family and the Greenwich Workshop. This limited unframed Affinity Aluminum Edition is brand new and ships flat and fully insured in a sturdy box. It includes a hanging apparatus and a Certificate of Authenticity (COA) from the publisher. The Widow's Mite is the first James Christensen work of art to be offered as an Infinity Aluminum Edition metal print. The significance of this to the collector is in the incredible art viewing experience and an edition size of only 550. This limited edition has been authorized by the Christensen family and the Greenwich Workshop. Image Size 33" x 39"
This limited Affinity Aluminum Edition is brand new and ships fully insured in a sturdy box. It comes in an Olde World burl frame w/gold inlay, and includes a Certificate of Authenticity (COA) from the publisher. The Widow's Mite is the first James Christensen work of art to be offered as an Infinity Aluminum Edition metal print. The significance of this to the collector is in the incredible art viewing experience and an edition size of only 550. This limited edition has been authorized by the Christensen family and the Greenwich Workshop. Image Size 22.25" x 26.5"
This extremely rare print has never been framed and comes perfectly mint with its original folio, and includes a genuine certificate of authenticity from the Greenwich Workshop. This print is individually numbered and hand signed by the artist James Christensen, and the colors are still as rich and vibrant as they were over 30 years ago! This framed signed and numbered limited edition paper print is in excellent condition with rich colors. It comes deluxely framed in an ornate gold frame with nailhead trim and linen liner. It includes a personalized note from James Christensen written in gold ink saying, "Peace and Blessings - James Christensen". This framed print also comes with a brass nameplate, and includes a genuine certificate of authenticity from the Greenwich Workshop. The print is individually numbered and hand signed by the artist James C. Christensen. Additonal pictures are available upon request. This porcelain figurine sculpture is brand new and ships and fully insured in a sturdy box. It was inspired by popular artist James Christensen's highly sought-after painting and limited edition print. It is finely crafted in porcelain, and includes a Certificate of Authenticity (COA) from the Greenwich Workshop. James Christensen says that the story of The Widow's Mite has long been one of his favorite moral tales. As written in the New Testament, Luke 21:1-4: "He looked up and saw the rich putting their gifts into the treasury, and He saw a poor widow put in two copper coins. And He said, 'Truly I tell you, this poor widow has put in more than all of them; for they contributed out of their abundance, but she out of her poverty put in all the living she had'." Christensen tells us, "And Jesus and His disciples watched, the town's rich men made an ostentatious show of putting their gold and silver in the Temple treasury. They watched, judging each other and proudly displaying their own grandiose offerings. It was a show of reverence instead of the real thing. Then, into their midst walked a poor widow. She came simply and without fanfare, unaware of the impression she made. While the rich men looked in disdain at her pittance  she hadn't even troubled to carry the coins side by side to increase their gleam — Jesus understood that this poor woman's small gift was of a magnitude unattainable by mere wealth. "I pictured this widow as young," says James Christensen. "Suppose she had children? If so, her gift was greater still. But she didn't think of how large or small her gift was. She merely gave what she had. I wanted to show that purity of thought and action. In The Widow's Mite, the lights and shadows are symbolic of spiritual and worldly power. The woman glows with an inner light. By contrast, the rich, bejeweled city fathers are in the dark. Even the widow's clothing, though ragged, glows with a celestial light. The point here is not money, it's what we are willing to give of ourselves." The Widow's Mite by James C. Christensen as well as other limited edition biblical and fantasy paper art prints and canvases, giclees, images, lithographs, paintings, pictures, posters, and reproductions by renowned Greenwich Workshop artist James Christensen can be viewed and purchased at special sale prices at Christ-Centered Art.